According to a new market research report "DIY Home Automation Market by Offerings (Hardware and Managed Services), by Technology, and by Geography (The Americas, Europe, APAC, and RoW) - Global Forecast to 2020", the total DIY Home Automation market is expected to reach USD 21.30 Billion by 2020, at a CAGR of 37.9% between 2015 and 2020. Increasing desire of the consumer for convenience connectivity, safety & security and the low cost of DIY systems are the major drivers for the market. The DIY home automation concept helps the homeowners to convert their home into an automated home. The DIY home automation systems do not require any professional for installation of products. DIY home automation products are designed in such a manner that they are very easy for the user to install and do not require high level of technical knowledge. The affordability, consistent performance, and interoperability of the DIY systems are key factors for success in DIY home automation market which makes it more lucrative for the end users as compared to the other systems. 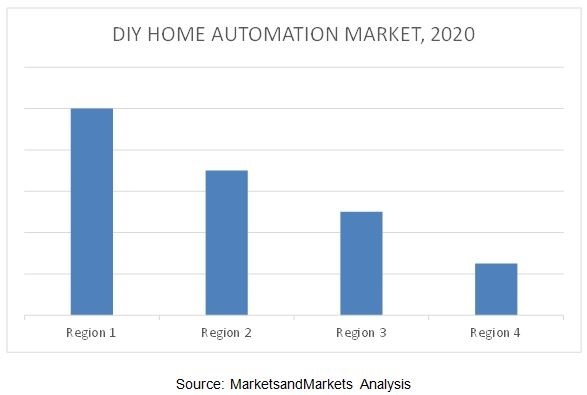 The major factors attributing to the growth of DIY home automation market is the increasing desire of the consumer for convenience, connectivity, and safety & security. The demand for energy efficient and green product solutions has increased due to various government initiatives to improve energy efficiency, which in the end has generated the demand of energy management and lighting control products. Security & access control products dominates the DIY home automation market with the highest market share in 2014. The Americas region is the largest contributor in DIY home automation market; followed by Europe and APAC regions. The various security control products such as smoke detectors, security cameras, and garage door sensors have a huge demand in the market in the Americas. Additionally, increasing crime rates and the increase in the number of rented houses is expected to create a huge demand for the DIY home automation products. The DIY home automation market has been segmented on the basis of offering (Hardware and Managed Services), by Technology (Networking technologies, wireless technologies, and other protocols & standards, and by Geography (The Americas, Europe, Asia-Pacific, and RoW). Apart from the market segmentation, the report also covers the Porter’s five forces analysis, the market’s value chain with a detailed process flow diagram, and the market dynamics such as drivers, restraints, opportunities, and challenges in the overall DIY home automation market. The major players in the DIY home automation market covered in this report are Nest Labs, Inc. (U.S.), Smartlabs, Inc. (U.S.), Nortek, Inc. (U.S.), Ingersoll-Rand Plc. (Ireland), iSmartAlarm (U.S.), Belkin International, Inc. (U.S.), Wink (U.S.), Mi Casa Verde, Inc. (Japan), Lowe’s Iris (U.S.), iControl Networks (U.S.), and SmartThings, Inc. (U.S.) among others.